I am a skeptic when it comes to childcare for my kids. Period. I leave them to few close friends and family members. I actually chose to be a stay at home mom for this reason. Conversely, I glom onto a good babysitter/nanny/childcare provider because it makes all the difference in the world not having to worry when I step away, knowing my sweet littles are in good hands. Enter Cal Fit Arden Kidz Klub and Childcare. I have so many nice things to say about the “teachers” (as my 3 year old likes to call them, probably because of arts & crafts and story time). From the activities they do, to the parties they throw, they put a ton of hard work, positive attitude and heart into making sure that the kids there have a fun experience. Kai is always eager to show me the arts and crafts project. Luke loves Noodle Hockey (where a foam pool “noodle” is used in place of a hockey stick). Carson, my toddler loves to play outside and do story time and songs. My kids actually want to go to the gym. That’s right, they look forward to it. As soon as my 6 year old gets out of school, he asks what time we will be going. They all know my kids by name and greet them with a big smile when we come in. 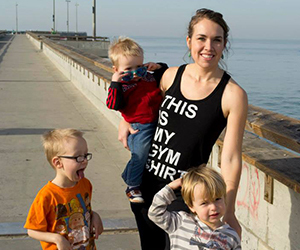 It has been so helpful in me getting back into “pre-baby shape” when my children are actually a huge motivation for me to go workout because they are disappointed if we don’t go as planned. I know that I am going to get “me time” because of the great job that Kidz Klub/Childcare staff does. The entire childcare staff at Cal Fit Arden puts so much energy into what they do. For example, they held a Harvest Festival and Trunk-or-Treat on Halloween week for the kids and their families. They blocked off part of the parking lot and childcare staff each decorated trunks for the kids to pick up treats from. It was really sweet to see the employees themselves taking the time to decorate their trunks in cute and appropriately spooky ways. They went above and beyond to make it special for the kids. I won’t even go into the Pirate Party they held a few months back which entailed a REAL pirate ship being towed in! They also had a jump house, a cotton candy machine, snacks, face painting (by one of their very own employees, and she was GOOD!! ), and carnival games. My boys had an absolute blast. It was also very obvious during the event that their staff was extremely competent and comfortable around children because they were managing the bounce house so that small children and bigger kids had separate alternating jump sessions to optimize safety as well as fun. As usual, Courtney (their lovely Childcare Manager) seemed to know all of the kids there by name, even with costumes on. There were Kidz Klubbers and other employees dressed in adorable outfits that coordinated with their Trunk-or-Treat theme and everyone just seemed to be enjoying themselves, and by that I mean kids, parents and employees. It’s just so nice when you can bring your kiddos by and they are always excited to see them. They just do a great job, you can see it in their attitude and the effort they put into making the children’s time there fun, meaningful, and active. So, Thank You, for being THAT good!